We arrived home Thursday. Pierre, our cat, is glad to be back and so are we. Our visit to Durango lasted four days. The big attraction was the Durango to Silverton train on August 19. On August 20, we relaxed in preparation for our drive to Mesa. A beautiful scenic drive between Durango and Ouray was the highlight August 21. Our campground in Durango was the Alpen Rose. Though it had the typical high rate discovered this summer, we thought its management was terrific. They greeted us by name as we pulled in. Earl detached the Jeep we pull and was escorted to the site while I registered. On our final evening, they attached a thank you note for using their campground on the door of our RV. Dog lovers will appreciate the dog park and also a pet walking service. They have a pool, free WiFi and cable, and daily pancake breakfast for $6.99. I recommend this one to our RV friends. On the way home, we stayed one night in Holbrook, Arizona at OK RV Park. It provides no recreation. But they supplied the best WiFi and cable service we had on the whole trip. The Durango and Silverton Narrow Gauge Railroad reached Durango July 27, 1881 and Silverton in July 1882. It was built as part of the Denver Rio Grande to serve the mining camps and was DRG’s first line built with rails made of steel rather than iron. This branch was the San Juan extension whose other end is the Cumbres Toltec trip (from Antonito near Alamosa to Cumbres) I told you about. Operation of the Silverton branch of the DRG had always been challenging with mudslides, avalanches, blizzards, floods even war interrupting service since it arrived in Silverton. Another problem was decreasing profits from transporting the ores after World War I. Continuing financial problems and mismanagement led to the railroad’s reorganization in 1921 as the Denver & Rio Grande Western. The rapid spread of automobiles and highways since the 1940's cut drastically into railroad business. Durango lost its daily rail connection to Alamosa. By 1947, the Silverton line was in danger of being abandoned. Hollywood discovered the line in the early 1950's and produced a number of movies in that decade such as “Denver & Rio Grande” and “Around the World in 80 Days.” Later the film “Butch Cassidy and the Sundance Kid” used this railroad. Passenger service continued to increase on this branch as it turned more and more into a tourist line. Charles E. Bradshaw Jr., a Florida citrus grower and businessman, It was Bradshaw who changed the name of the railroad to the Durango & Silverton Narrow Gauge. It has been sold twice since. My Miami, Florida readers will find it interesting that the current owners are Carol and Al Harper, who until recently lived in Coral Gables where I grew up. They are the founders of American Heritage Railways. The current train has four classes of cars in which you can ride: coach, deluxe, first class, and presidential. We chose their Silver Vista which is first class. 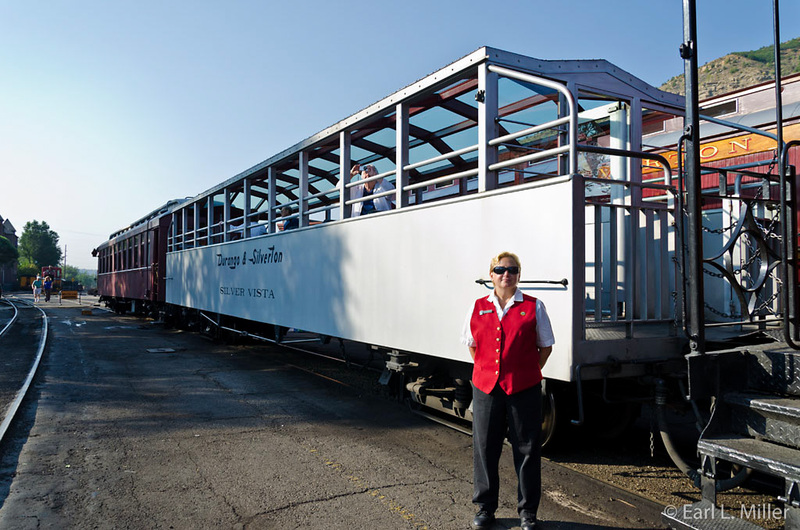 It’s the only glass-roofed observation car on any narrow gauge railroad. Leg room is excellent. Passengers receive a large canvas bag and a sealed mug as souvenirs of their trip. An attendant, who points out most of the sights, serves unlimited cold drinks, coffee, hot chocolate and water. A weakness is the attendant does not have a microphone. Seats are assigned. On our way to Silverton, all the seats were full so we couldn’t move. Unfortunately, we couldn’t hear Irene, our attendant, in the back where we were sitting. Some people chose to take the bus back from Silverton so there were empty seats. I advised Irene of the narration problem, and she stayed close to us pointing out the highlights on our return trip. Another first class car exists, the Alamosa Parlor car. It is lounge style with tables and chairs and offers the same amenities. It was the next car to ours. Earl visited it briefly and found the ride rougher and that its furnishings make it more crowded. The deluxe class has the Rio Grande, an open gondola with seating; San Juan, seating three across; and Prospector, with tables and chairs. The Prospector is the only one of these with an attendant. All have souvenir mugs for the all day use from the concession car. Standard cars have a seat the width of an economy class airplane seat and provide no extras. The Presidential Class is restricted to those ages 21 and older and is considered the premier coach with the most elegant seating. Age restrictions apply to all other classes than coach. In first class, you have to be age 16 or older and in deluxe the age is 12 and older. Prices are $179 for Presidential; $169 for first class; $129 for deluxe class; and $89 for standard. On some weekends, a 10% senior discount is offered for passengers in coach. A 6% historic preservation fee is added to all fares and parking is an additional $7. Most of the steam locomotives they use are Baldwins which were made in Philadelphia from 1923-1925. They’re 100% coal-fired, steam-operated. Their oldest is #42 built in 1890. The line runs one to three trains a day based on ridership with June 1 to August 1 being its busiest time. Service is year round. It’ doesn’t run on the original ties as one fifth of these are replaced annually. It takes 3-1/2 hours to Silverton where you have a 2-1/2 hour layover if returning by train the same day. Options are to stay overnight and take the next day’s train back or return by bus to Durango. I was surprised at how many in our car took the bus back. Your trip starts downtown. It passes a glider airport, campgrounds including the one we stayed at, and a golf course. You travel along the Animas River through valleys, canyons, and forests. Grade ranges from 1.5 to four. You pass several mountains that are considered close to 14,000 feet tall. There are four trestles on the route. A highlight is crossing the High Line with its 190-foot long High Bridge. Another is when you can actually view the train take on approximately 10,000 gallons of water during the round trip. On the way to Silverton, you make water stops at Tank Creek and Needleton Tank but only Needleton Tank on your return trip. We accidentally came to Durango during its Railfest which lasts for four days in August. This made it possible for us on our return trip to spot two railroad cars only used during festival time. RGS (Rio Grande Southern) Galloping Goose #5 is one of the seven cars built originally from Pierce-Arrows and Buick-6s. They had a one man crew and operated on gasoline. 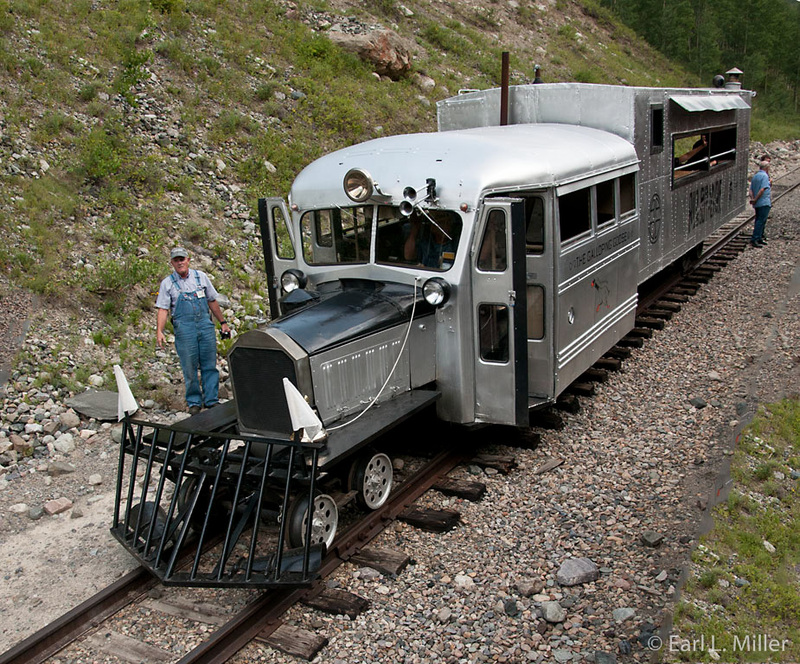 This train had a 1928 Pierce-Arrow body and engine. Her engine was changed in 1946/47 to a GMC gasoline engine and a Wayne Corporation school bus body. Galloping Goose #5 was constructed in 1933 and restored to operating condition in 1998. 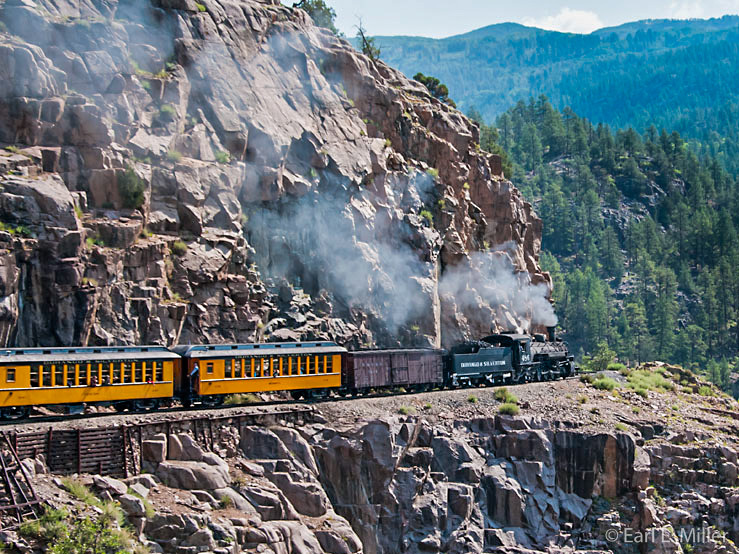 She runs on the Cumbres & Toltec in June and Durango & Silverton Narrow Gauge during Railfest. Otherwise, she is on display at the railroad depot in Delores. Originally this train carried freight, mail, and some passengers, but in 1950, the freight-mail compartment was converted to carry 20 additional riders. We also passed the Eureka. It was built in 1875 for the Eureka and Palisade Railroad and is the only wood burning train in the United States. It was purchased by Warner Brothers in 1939 and used for such films as “The Great Train Robbery.” Its last appearance was in “The Shootist” in 1976. It is owned by Las Vegas attorney Dan Markoff and used only at special events such as Railfest. On August 21, we spent the entire day in a scenic drive to Silverton then Ouray. We stopped on the way up at Honeyville, a factory store near Durango where you can purchase a variety of flavors such as vanilla and raspberry combined with honey to make creams, sauces and jams. They also make soap and wine out of honey. What’s interesting is you can see the little bear jars filled with honey processed at their store. First, they lay the bear bottles out. Then they go to a filling machine and finally to a capping machine. 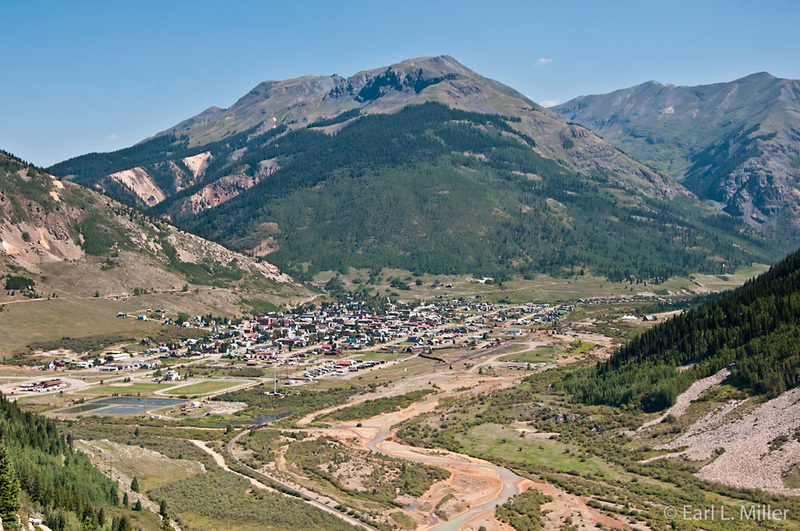 The highway between Durango and Silverton only follows the railroad route for a short distance. Then it goes on steep grades following the top instead of the river. We drove first through Coal Bank Pass, whose summit is 10,640 feet. We then stopped at the Molas Pass overlook which offers a beautiful lake view. This pass is 10,899 feet. We briefly followed the route to Animas Ford but found the 14 miles would take too long to go the distance. The road is very rough and you can’t drive more than five to ten miles an hour for most of it. You do see old mines along the way including the Mayflower Mine which you can still tour. It was built in 1929 and was the only mine in the Arrastra Gulch to have metal aerial cables. We had lunch in Silverton at Handlebars - average food but a taxidermist lover’s dream. It’s filled completely with animal heads as well as total animals such as a deer. We also visited the Silverton Depot whose displays are mainly photographs, paintings, minerals, and one old baggage cart. The signboard outside explains about the four railroads which once traveled through this area. 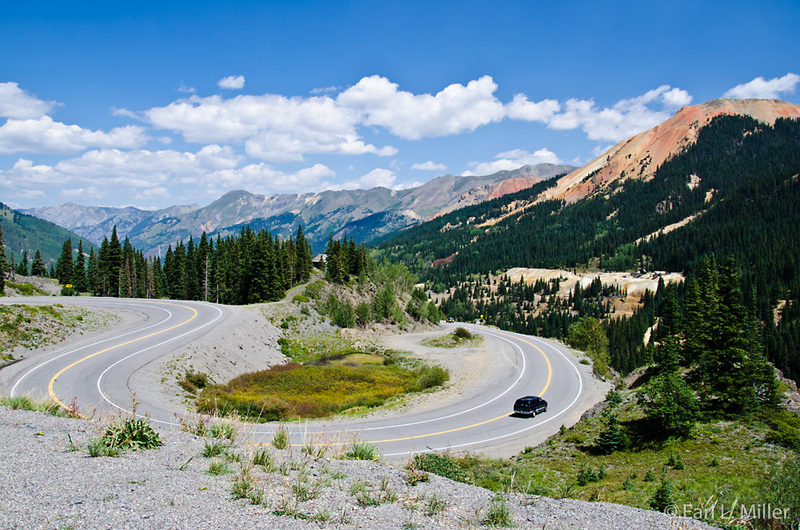 The road to Ouray is called the “Million Dollar Highway.” It’s a very winding, narrow, no shoulders, deep drop to the bottom highway. It runs through Red Mountain Pass. The route is extremely scenic but should only be driven by those who have mountain driving experience. This will be the last email on our trip. We hope you have enjoyed following our Colorado adventure.